Address: Located at Prince Edward Point at the end of County Road 13. Make the scenic trek to the furthest point in Prince Edward County. Bird lover/watchers come out this way for the bird observatory but if your into history and exploring this abandoned lighthouse is worth seeing. Driving into the point as far as you can you will reach a parking lot and see the lighthouse across the bay, if you head into the trail and around the water you will come back on a trail and past some private homes to get to this gem. Check out the beautiful shoreline around the Lighthouse. Enjoy a wistful breeze, pebble stone ad regular sand beach and clear blue waters. Prince Edward Point, the southeast tip of Prince Edward County, has had multiple names through the years. When the dominion government appropriated $1,200 in 1879 for a lighthouse on the point in response to a petition signed by numerous captains of vessels and steamboats, the point was known as South Bay Point. It has also been called Point Traverse. A contract for the construction of the lighthouse was awarded to John W. Fegan in 1880, and the lighthouse was placed in operation in 1881. Thomas Fegan was temporarily placed in charge of the light from June to October 1881, when Daniel McIntosh, the official keeper, took charge at an annual salary of $150. A lighthouse upon the extremity of South Bay Point or Point Traverse, on Lake Ontario, in the County of Prince Edward. This light is a fixed red catoptric, elevated 36 feet above water mark, and should be visible 10 miles from all points seaward. The building consists of a square wooden tower, 36 feet high, with keeper’s dwelling attached. The sum of $1,349.57 was expended in the construction of this lighthouse during the past fiscal year, and further expenditure will appear in the accounts of the present year. During the 1882 – 1883, fiscal year, another $959.13 was spent on the lighthouse, bringing its total cost to $2,308.70. In addition to this, John W. Fegan was paid $36.70 for building a boat and boathouse. Immediately north of the lighthouse is Long Point Habour, a small bay about two acres in size, that offers refuge to small vessels drawing four feet or less. Larger vessels seeking refuge would use the much larger South Bay, known now as Prince Edward Bay, which is just north of the smaller bay and offers deep waters and good anchorage. A lighthouse was built on False Duck Island, just off the mouth of South Bay, in 1828, but mariners wanted an additional aid to mark this important harbour of refuge. Keeper McIntosh served until 1902, at which time the Department of Marine cancelled his appointment “owing to advancing years, and for the efficiency of the service.” Keeper McIntosh was sixty-nine when he was replaced by Marcellus Vorce, who received an annual salary of $200, the same amount that Keeper McIntosh had been earning. Prince Edward Point Lighthouse originally used a catoptric apparatus, composed of lamps and reflectors, to produce its fixed red light, but in 1909, a fourth-order, 360° French lens was placed in the lantern room. 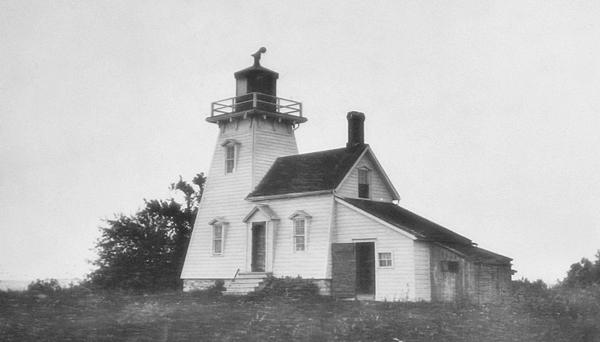 The Canadian government discontinued Prince Edward Point Lighthouse in 1912, but in response to universal demand, the light was placed back in operation with the opening of navigation in 1913. In 1941, the light was automated, and its characteristic was changed from fixed red to flashing green. A forty-two-foot-tall skeletal tower was erected adjacent to the lighthouse in 1959 to display a flashing white light, and the lantern room was removed from Prince Edward Point Lighthouse at this time. This skeletal tower remains active, displaying a flashing white light at a height of forty-six feet above the surrounding water. Prince Edward Point Lighthouse is located within Prince Edward Point National Wildlife Area, which was established in 1978. During the annual migration, there is no other place on the northern shore of Lake Ontario where birds can be seen in such high densities. Over 300 species of birds, some of which are at risk, have been recorded on the point. Keepers: Thomas Fegan (1881), Daniel McIntosh (1881 – 1902), Marcellus Vorce (1902 – 1912), Waite J. Hudgin (1912 – 1927), William J. Ostrander (1927 – 1941).